President Museveni condoled with the people of Bufupa who lost loved ones. President Yoweri Museveni has promised to resettle and offer relief to the victims of the landslides that hit Budadiri in Sironko district, Eastern Uganda in August this year. The President who visited the victims on Wednesday said that in order to create a lasting solution, government will have to persuade people settling on top of the cliff to be resettled in a safer location. He said that government will intervene to educate people on how they can better utilize the cliff. “I came here to express condolences on behalf of government for the people that died in Bufupa. We were able to recover some bodies though we couldn’t retrieve others; I have also come to ensure that no more people die due to land slides,” Museveni said, while speaking to the victims majority of whom lost property and houses. 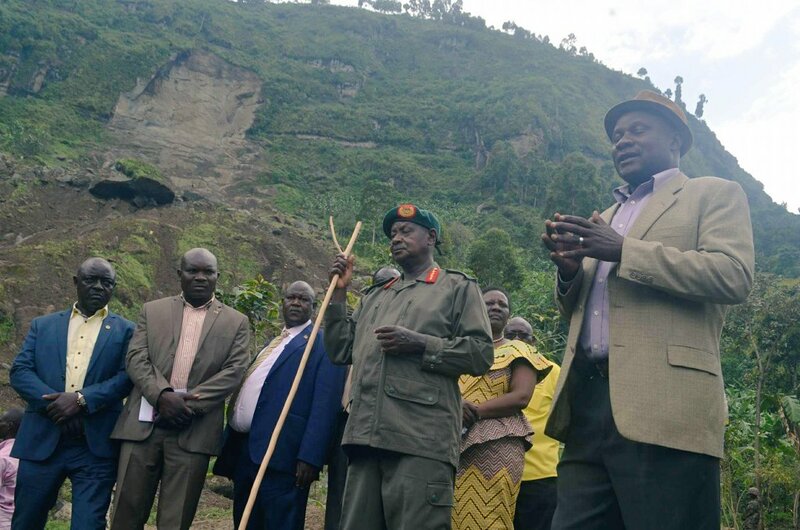 “We shall ensure that no houses are set up 500 metres from the cliff but can be used to plant perennial groups like coffee and ovacados,” Museveni said. “The area can be used economically but not for residential purposes. We are ready to assist those who are willing to construct organised houses 500 metres from the cliff,” the President added. He instead advised them to cultivate in contours to guard against heavy water washing away the crops. He said the space can also be used to grow onions, Arabica coffee, template fruits like grapes and apples. “I have directed the Minister of Agriculture and Mary Gorett Kidudu (State Minister for Environment) to implement enlightened farming in the mountain areas,” he added. The President further promised to construct new roads in the area to make them passable as well as ease transportation of agricultural products. “It is very easy to construct good roads which are not necessarily tarmac but we can use these rocks which are killing us for strong roads,” Museveni said. He was accompanied by Ministers Irene Muloni (Energy), Musa Echweru (State for Disaster and Relief), Vincent Ssempijja (Agriculture), Hillary Onek (Disaster and Relief) and area Members of Parliament. A total of 7 people were reported to have been killed during the landslides that occured in Bufupa village in Budadiri Sub-county in Sironko district on August 28. According to the area leadership, a total of 70 people have since been displaced and are living miserably, failing to settle down to carry out any income generating activities.